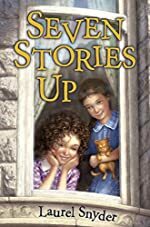 Seven Stories Up by Laurel Snyder. Review: What if 50 years just melted away? Well, Annie Jaffin experiences her grandmother's lonely childhood right along with her as if 50 years had just melted away. In Seven Stories Up, it shows compassion and love like you have never known before. Annie Jaffin visits her dying grandmother for the first time and finds out that her grandmother is someone she would never love. But when Annie wakes up, a strange girl is in her room. The girl introduces herself as Molly Moran, Annie's grandmother. Annie is shocked to see her grandmother at such a young age. But over time, they get to know one another and they start sneaking out. But when Molly starts getting in more and more trouble, the duo start to suffer the consequences. Find out the rest by reading Seven Stories Up. We would like to thank Random House for providing a copy of Seven Stories Up for this review. Have you read Seven Stories Up? How would you rate it?